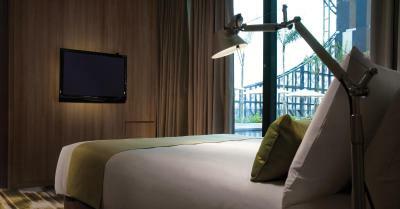 Lock in a great price for Crowne Plaza Changi Airport – rated 9 by recent guests! Being at Changi Airport means it has a great location for early morning flights. I booked a Club Room. A bit strange odd to have neither flowers nor a plant and no welcome fruit bowl which is standard in Singapore and most hotels world wide. A very odd concierge who told me to go down to reception to extend my stay as she could not reach them by phone? ?It was very easy to just make another reservation in my room on my laptop with Booking .Com. The coffee maker in the room was faulty and had to be replaced. The new coffee maker works in fits and starts. BUT the bed is great. Room is very clean. They changed the hard heavy pillows for me to large soft ones. It is bizarre that the Club Lounge is on a different floor from the Club rooms. Highly inconvenient . BUT I would stay here again due to the convenience to the airport and cleanliness . Room service food quality is very good specially the Mushroom burger which is the best I have had anywhere. The location was great and staffs were quick in checking-in. They upgraded me because I was a IHG member, though I couldn’t book through them. Bathroom facilities very nice. Efficient room design very clever. Location is perfect for early morning flights, an added bonus is the shopping and food outlets on the basement level. Breakfast was a beautiful array of various foods. Delicious. Many options. We literally walked from the terminal straight into the hotel. Beautifully situated if you need to stay close to the airport for a day or two. You should once experience this super convenient location! Convenience. Great bed. Quiet room. Easy access to the airport. Crowne Plaza Changi Airport This rating is a reflection of how the property compares to the industry standard when it comes to price, facilities and services available. It's based on a self-evaluation by the property. Use this rating to help choose your stay! 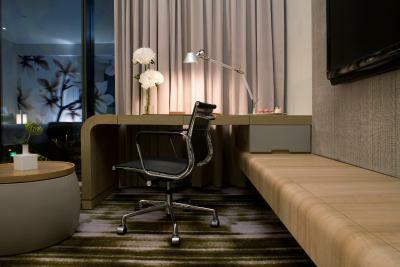 The trendy guest rooms at Crowne Plaza are spacious and feature an elegant interior with lavish designs. Bathed in plenty of natural light, each well-furnished room has a minibar and flat-screen TV with cable channels. The private bathroom has a rain shower. Changi Airport Crowne Plaza is accessible from Changi Airport Terminals 1 and 2 by a monorail system. It is connected to Terminal 3 by covered walkways. The center of the city is a 30-minute drive from the hotel. Crowne Plaza Changi Airport offers laundry and same-day dry cleaning services. 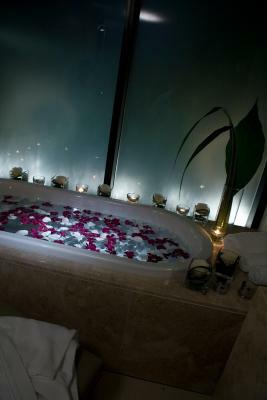 To unwind, guests can enjoy a relaxing massage at the hotel’s treatment rooms. 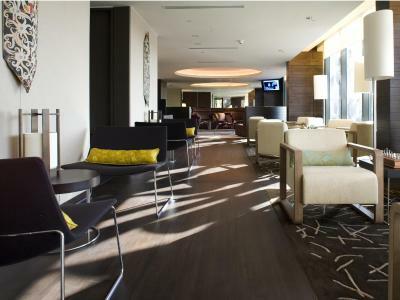 Some rooms include Executive Club Lounge benefits such as complimentary cocktails and meals. Cantonese dishes are available at the hotel’s Imperial Treasure Restaurant. Azur Restaurant features open concept kitchens serving Eastern and Western dishes all day. Wine and light refreshments can be enjoyed at bar75. 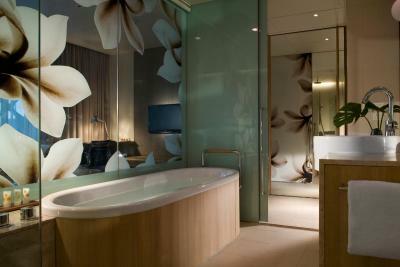 When would you like to stay at Crowne Plaza Changi Airport? 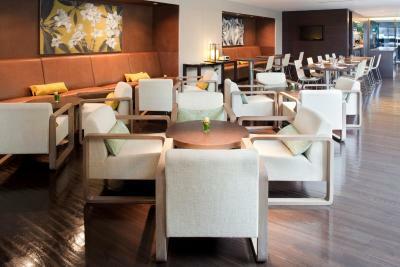 Offers Club Lounge access and privileges including free internet access, breakfast, evening cocktails and snacks. Private parking is available on site (reservation is not needed) and costs SGD 57.60 per day. 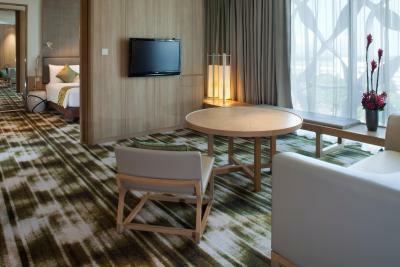 On high floor, this stylish and well-designed room has a flat-screen TV and minibar. The bathroom has a bathtub. Hotel surroundings – This neighborhood is a great choice for travelers interested in culturally diverse food, food and cleanliness – Check location Excellent location – show map Guests loved walking around the neighborhood! 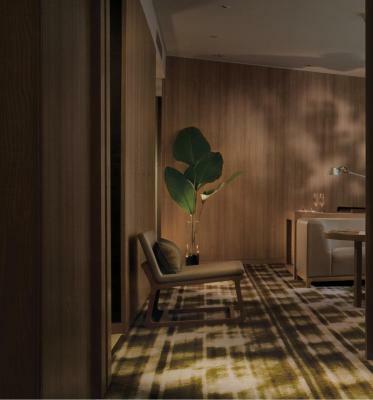 House Rules Crowne Plaza Changi Airport takes special requests – add in the next step! Crowne Plaza Changi Airport accepts these cards and reserves the right to temporarily hold an amount prior to arrival. Grace reception is so polite and excellent cso. Late check out allowed due to me a member. Chloe too. There was great difficulty with Crowne Plaza taking payment from my Visa Debit card despite ample funds ... I spent hours of my time in the days running up to my stay sorting this out...ringing my bank, Crowne Plaza (expensive) and Booking.com. I am given to believe that the problem lay with the manner in which Crowne Plaza chose to process the payment. It would have been easier if you just let people know that you do not accept debit cards and can only accept a credit card for pre-paid bookings. maybe? So this added to the cost of my trip and the stress. I do not fly frequently, Mir do I generally travel alone, so getting this right would have really helped. Having said all this, my stay, especially in the room adjacent to the pool the first time, completely made up for it. Your hotel staff are really first rate, kind and very helpful. Your rooms are spacious, clean and really well designed. I slept soundly and felt very safe in your lovely hotel. I would have loved the same room by the pool again! The second room in the jewel wing was lovely too, but I didn’t really want to trudge over to the pool in my gown from there! Obviously not every room can be next to the pool, I just got lucky the first time. It was very special for me. Thank you very much. The pool, the room, the room service, the staff. It was a little costly - but location is everything. I was between flights and this was just the right location. The breakfast had a great range of food. Having a bath as well as a shower was a highlight. Total commitment!! Great place !! Would love if the pool is more child-friendly. Nonetheless, considering that the hotel focuses on business-minded travelers, appreciates its effort to still cater to children traveling with families. The privacy & quiet despite its location being at an airport. Its close proximity to shops and eateries. Location and speed of check in and check out. The hidden room safe which seemed to be a panel of the desk. The absence of any hotel guide/ info book in the room. The lack of any complimentary fruit, cookies or flowers. The club lounge located so far away on a different floor. I’m not sure if my room was missing a “day” window cover in the bathroom - I ever had to have the blind fully up or dark and closed. With the mini bar there was tea and milk but not little cookie / chips etc - sometimes you just need that little something when you don’t want to order a meal from room service. Even if biscuits / snack style food was on room service that would be good. It was very convenient, only taking 10 min to get from terminal 1 to 3. The bath was perfect after a long flight. My flight was delayed so get to spend time by the pool. Couldn’t believe I was at an airport hotel it was so tropical and relaxing.